A body is not made up of a single particle instead it is a collection of large number of particles arranged in a particular way. Here we find a point in a system of a collection of particles that behaves as the centre of the combination of the total mass of all particles which is called centre of mass of the system of particles. A rigid body can be taken as a collection of particles. Here we find the centre of mass of a rigid body. 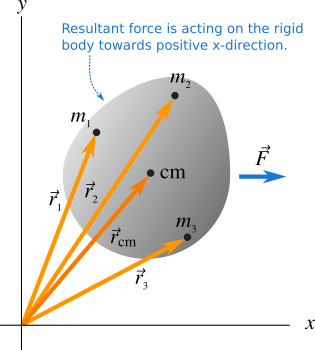 A net force acts on a rigid body as shown in Figure 1. The body is made up of a large number of particles of masses $m_1$, $m_2$, $m_3$ etc.. Figure 1 The centre of mass of a system of particles.